The acoustic sound of Patsy Cline’s slow-burner ballad, “She’s Got You,” filtered back from the stage to the brick walls of Biddle’s Escape in Wilkinsburg. An older couple slow danced in the only open space in the packed coffeehouse, while the rest of the 50-person audience cradled steaming cups in their hands and listened, attentively bobbing to the rhythm. In a crowd that was mostly middle-aged, it was easy to spot the groups of college students who had come from Pitt to support their professors, several of whom were onstage performing in the band Smokestack Lightning. Though the seven-person band is made up of a variety of personalities and instruments, Smokestack Lightning is united over their commitment to advocate for social justice through music. The band began in 2003 as an unofficial department project between Bernard Hagerty and Scott Smith — both history professors at Pitt. Their name comes from a blues song of the same name that Howlin’ Wolf, a blues singer, first recorded in 1956. Though Smith and Hagerty are no longer in the band, the current musicians continue their legacy of playing music about the labor class and related issues, including unionization and the rights of LGBTQ+ students. When the Patsy Cline song finished, one band member, Tom Hoffman, stepped up to the microphone to announce the next — “The Mountain” by Steve Earle — and his words prompted a roar of applause from the approving crowd members. “This next song is about love of place, dedicated to all those folks in Standing Rock, protecting your place,” Hoffman said. Smokestack Lightning’s gigs are usually fundraisers and free venues, such as Biddle’s Escape, Wigle Whiskey and the Friends Meeting House. The band isn’t part of the American Society of Composers, Authors and Publishers, an organization which collects licensing fees from musicians, then redistributes them back to members as royalties, essentially regulating copyright for musicians and composers. Because of this, they aren’t permitted to perform covers for profit — but this matters very little to any of the band members, who care more about the cohesion of the band and the issues they sing about. Band members Coles and Steve Weber are both Pitt professors — Coles in the English department and Weber in the chemistry department. They’re joined by guitar player Phil Smith, who retired from Pitt’s English department in 2014, and CMU professor of computer science William Cohen, who’s on a six-month sabbatical to work for Google in Pittsburgh. Other members include David McLaughlin, who often plays fiddle, Heidi Wettlaufer, a talented vocalist, as well as Hoffman, a guitar player and a lifelong labor organizer who also works part-time for the Sierra Club. The Sierra Club is an international grassroots environmental organization which works locally to solve the problem of sewage in rivers. 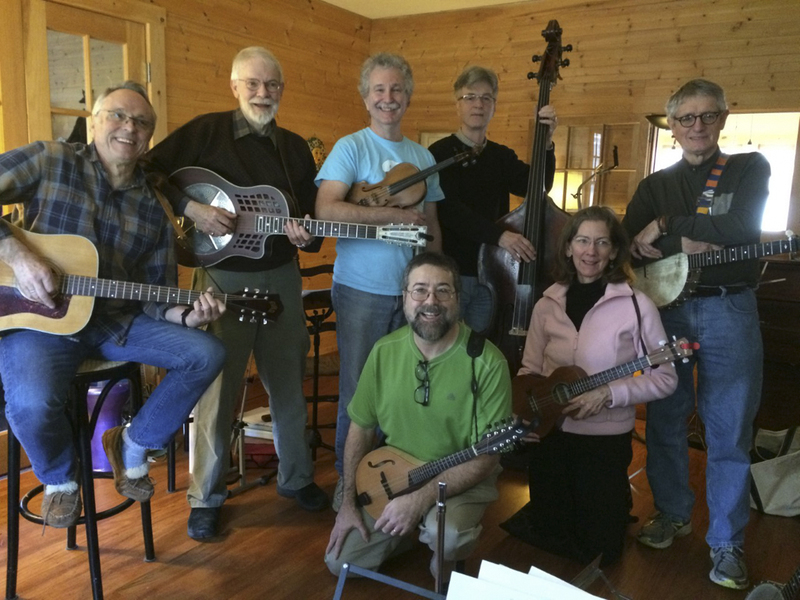 The acoustic band plays primarily, but not exclusively, blues, bluegrass and folk and uses a variety of instruments including guitar, upright bass, ukulele, banjo, mandolin, fiddle, harmonica and dobro — a type of acoustic guitar with embedded steel disks. Their set list includes not only covers, but a number of original songs as well. Coles, an Oxford graduate with a slight accent, finds music inspiration in Woody Guthrie. He’s been a professor at Pitt since 1980, in that time redesigning the Working Class Literature course to cover everything from sorrow songs of slavery times to Guthrie to Tracy Chapman. Guthrie’s a favorite among several members of the band, who admire his politically charged folk music, which speaks to both the band’s general sound and their efforts to advocate for social justice movements. “Woody Guthrie said that he didn’t want any of his songs to be copyrighted because he wanted them to belong to the American people,” Coles said. Coles is a Quaker, and organizes an annual benefit in early December at the Friends Meeting House in Shadyside, which usually brings a crowd of about 100 people. Last year the benefit raised $1,550 for both the Greater Pittsburgh Literacy Council and the Pittsburgh Student Action Coalition, which works toward reproductive rights and transgender rights for sexually nonconforming kids in schools. “I’m not a party member for this or that, but for me, it all comes under the heading of justice. Struggles of justice of one kind or another. I think workers’ rights are humans’ rights, as are women’s rights,” Coles said. Smokestack Lightning also played the Roots Cellar venue at The Pittsburgh Center for the Arts for free on Jan. 13, in support of the push for a union for Pitt faculty, which does not yet exist at the University. Fittingly, the band played mostly traditional union songs, such as one called “Which Side Are You On,” written in 1931 about a miners’ union. When the band is constructing their setlist for a gig, they include both covers and original songs, though their criteria is far from strict. “The only defining characteristic is that someone in the band likes it and can convince the other people in the band to play it,” Hoffman said. The band chooses which social issues to sing about and fundraise for in the same way — one of the bandmembers suggests a topic, usually one that they are personally tied to, and the other members are typically supportive of the idea. Hoffman, who has also played with Coles at rallies for the Fight for Fifteen movement, has written original music on the topic of adjunct professors, Pitt janitors trying to organize a union and people working at UPMC who can’t pay for their kids’ health care. Cohen has also written a number of songs, including one called “We’ll Just Complain,” which is about the Republican Party’s response to climate change, and “Billionaires on our Side,” a sardonic take on President Donald Trump’s Cabinet. “I usually come up with the idea for the song first, whatever the key insight or the joke is going to be, then I try and work it out from there, so the melody usually comes later in the game,” Cohen said. In addition to the type of music that they’re playing, Weber finds both importance and satisfaction in the synchronicity among the band members. The band’s sense of cohesion is something each member values and actively works to uphold. For the second New Year’s Eve in a row, the band went on a musical retreat to a friend’s cabin in Ligonier, Pennsylvania. They took along wives and girlfriends, food and drink and instruments, of course. For an entire day they focused only on music, suggesting songs, trying out new material and working new pieces into their repertoire. Smokestack Lightning is surprisingly unstructured, though, considering the ideology their members hold dear, this quality seems to be exactly what keeps them together, and with growing success. The band can be found on Facebook and SoundCloud, as well as their own website. However, with already well-established careers, none of the members of Smokestack Lightning are searching for their big break, and are content instead to simply play the music they love and continue fighting for the causes that matter most to them.